Singapuras weigh just 4-8 pounds when full grown, but these little cats have big personalities. Singapura, the Malaysian word for Singapore, means “Lion City.” In Singapore, the little feral felines that became the foundation of the Singapura breed were traditionally known as “drain cats” because they often took refuge in storm drains. Once persecuted as nuisances, these tiny cats have risen in stature as a result of their increasing popularity in North America and Europe. Hal Meadows brought some little drain cats from Singapore to the U.S. in the early 1970s. These cats, along with an additional cat obtained from Singapore’s SPCA by Sheila and Brad Bowers, were used to establish the Singapura breed. Hal’s wife Tommy worked diligently to develop and promote the Singapura breed in North America, but controversy arose when it was discovered that the three Singapuras Tommy had used in her breeding program, Puss’e, Ticle, and Tes, had been born in the United States. Tommy asserted that these cats were grandchildren of the Singaporean cats that Hal had sent to the U.S. in 1971. Although the Cat Fanciers’ Association determined that the Meadows hadn’t done anything wrong, some accused the couple of crossing Burmese and Abyssinian cats and then passing the offspring off as a naturally occurring breed. 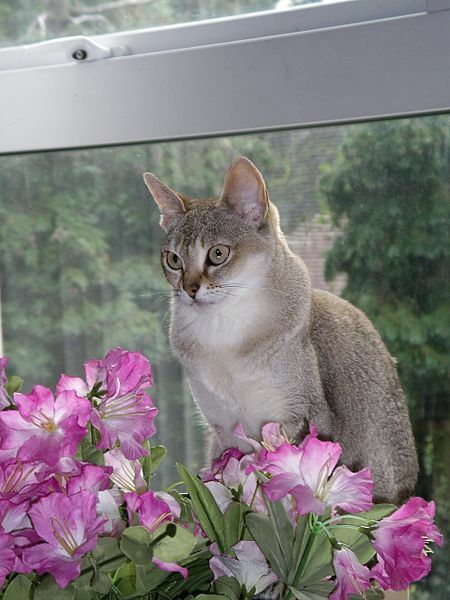 Despite the controversy, the Singapura has been accepted by all cat associations in North America and many more throughout Europe. 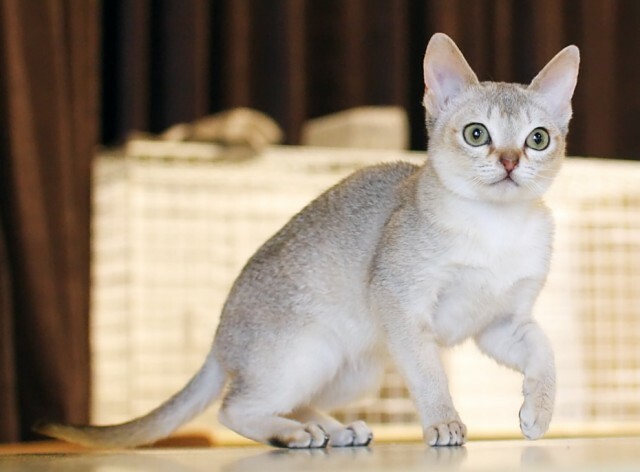 Although the Singapura was granted championship status by the Cat Fanciers’ Association just 22 years ago, many Singapuras have won Grand Champion or Grand Premier titles, and the breed has attracted a cult following among cat fanciers. The popularity of the Singapura in North America has benefited its feral relatives back in Singapore. In the past, local authorities sought to exterminate these cats as pests, but the Singapura has recently been adopted as Singapore’s official mascot, complete with an ad campaign featuring these little cats to attract tourists and statues of Singapuras placed alongside the Singapore River. Singapuras are muscular, stocky, strong little cats, with big ears and large almond-shaped eyes in shades of hazel, yellow, or green. Their small bodies, round faces, and large features create a kittenish appearance. 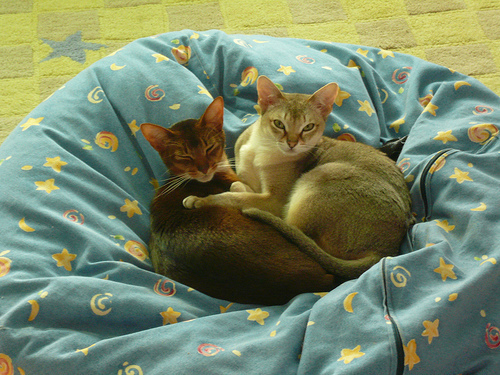 Singapuras have fine, short ticked coats like the Abyssinian, but their colouring is different. Alternating bands of ivory and sepia on each hair generate a unique shade of light beige that some have compared to cougar fur. The Singapura’s forehead is marked with a tabby “M”, and many Singapuras have cheekbone shading and other facial markings such as dark lines extending from the outer corners of their eyes and brows. The Singapura is the world’s smallest official domestic cat breed. Adult males weigh just 6-8 pounds and females 4-6. A slow-maturing breed, Singapuras take up to 2 years to reach full adult size. Although cats of most other breeds are capable of procreating as young as 5 or 6 months, the Singapura may take over a year to reach sexual maturity. The Singapura is a natural breed, and out-crossing with other breeds is not permitted. Singapuras are people-oriented, extroverted, curious, affectionate, and inclined to retain their playfulness well into adulthood. Among the brighter and more interactive breeds, Singapuras require a lot of attention. They are rarely shy, even with strangers, and like to be involved in whatever people are doing. Singapuras tend to enjoy lap sitting or perching on the shoulders of their favourite humans. Agile and active, Singapuras are climbers and love high places. They are often mischievous, though rarely nasty. Most Singapuras are not confrontational or aggressive, and even males are usually not inclined to squabble. These cats have soft, gentle voices, and are not usually talkative, except in the case of empty food dishes and other emergencies. Singapuras are naturally sensitive and intuitive. They will often bond with several people in a household rather than favouring just one, and they are open to making friends with new people. They tend to be good with older children who are able to handle cats calmly and gently, but may be traumatized by boisterous, noisy, younger children. A worldwide survey of Singapura breeders identified no significant health issues associated with the breed. However, given that true Singapuras are purebreds, potential adopters should obtain cats from reputable breeders and request health guarantees. Pricing for purebred Singapuras varies based on applicable markings, bloodlines, and other factors. Singapuras are still somewhat rare, with just 5,000 worldwide, including pet quality cats, and very few breeders. In 2000, there were just 144 Singapuras registered with the Cat Fanciers’ Association. In the U.S., Singapura kittens cost around $2,200-$2,500, although pet quality Singapuras may be available at lower prices. To find Singapura cats and kittens in North America and Germany, visit the Fanciers Breeder Referral List (the Official Singapura Cat Club and the Progressive Singapura Cat Club provide UK listings). Helgren, J.A. (2010). “Choosing a Singapura.” PetPlace.com. Maggitti, P. (2000). “The Singapura.” PetPublishing.com. McHenry, C., Cat Fanciers’ Association. “The Singapura.” CFAinc.org. P&G Pet Care, Iams Cat Breed Guide. (2010). “Singapura.” Iams.com. Ruetz, N., Cat Fanciers’ Association. (15 June 2009). “Breed Profile: Singapura” and “The Singapura.” CFAinc.org. The Singapura Cat Club. (n.d.). “Singapura Breed Details.” SingapuraCatClub.org.uk. Tse, Y. (November 2009). “Singapurrra: Pesky People Pleaser.” Singapore American, AASingapore.com.